Unfortunately for the sport of paintball, there still lies the potential for injury when playing with certain paintball operators if the appropriate safety precautions are not taken. Although the industry is constantly expanding and the quality of equipment and procedures is going from strength to strength, some paintball providers continue to tarnish the paintball reputation among people who have never played with a trusted provider. 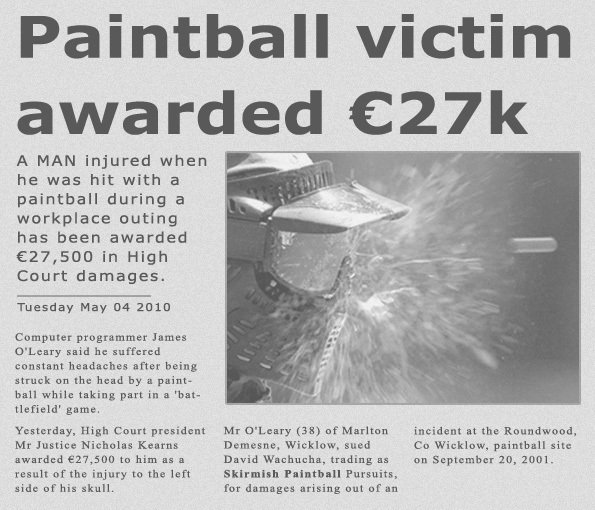 We were recently sent this article regarding Skirmish Paintball from a potential customer, concerned that a similar injury might befall her son and his friends. After some correspondence with Delta Force the lady in question decided to organise a day of paintball for her son’s birthday after hearing about Delta Force’s first class safety record and our full head protection goggle system. Delta Force is the only paintball provider in the UK to offer full head protection goggles as standard at no extra cost. Not only do these goggles fully protect your face and head, but they are also fully ventilated and equipped with ‘anti-fog’ lenses to keep your head cool and your line of sight clear. In addition to this, all Delta Force players receive custom-designed body armour and full length combat suits with protective collars. Most paintball operators don’t provide these goggles as they cost four times as much; many smaller companies cannot afford to make the investment. In fact, quite a lot of paintball operators throughout the UK are now using the face goggles that Delta Force decommissioned and sold on over six years ago. These operators now advertise their goggles as ‘full face goggles’ rather than the Delta Force developed full head protection goggles that we provide across all Delta Force National Paintball Centres.